The University of Lethbridge welcomed thousands of people to campus as part of our Homecoming Weekend celebrations from Sept. 1 - 3, 2017. We saw alumni fly in from all around the country and world to take part in the pinnacle weekend of our 50th Anniversary celebrations. For the women of Pronghorns basketball in the late 1980s and early 90s, their time as teammates and students forged an unflappable friendship - a testament to the experiences they shared together, on and off the court. Let It Shine On will be a legacy for the U of L, capturing not only its humble beginnings but its ability to ignite the dreams of students in the years to come. Amy Whipple (BA '07) used more than 30 pounds of butter, 90 cups of sugar and 150 eggs and spent more than 40 hours on perfecting her creation. Friday evening saw alumni come from far and wide to celebrate in the achievements of a few special people in the alumni community. The Alumni Association presented it's inductees of the Alumni Honour Society with their certificates of recognition including the Honourable Mr. 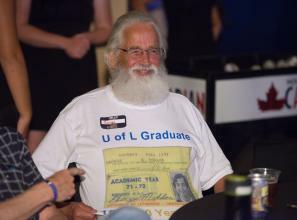 The University of Lethbridge Pronghorns’ most decorated athlete and Canada’s first Olympic hammer throw finalist since 1924 has said farewell to his sport. He's one of Hockey Canada's biggest fans. University of Lethbridge alumnus Dale Ptycia (BASc ’85) shares his passion for the game and for inspiring others. The University of Lethbridge Alumni Association inducted Craig Findlay (BEd ’93, MEd ’10), along with five others, into the 2014 Alumni Honour Society. One day, Kevan Bryant will impact a whole generation of learners. Today she is a student in the Master of Education, Counselling Psychology program, at the University of Lethbridge, where she has received a long list of scholarships and awards.